Think your nose looks too big in your selfies? The modern-day self-portrait ritual is prompting many to consider plastic surgery. "Patients under age 40 take out their phones and tell me they don't like how they look," Dr. Boris Paskhover, an assistant professor at Rutgers New Jersey Medical School's otolaryngology department who specializes in facial plastic and reconstructive surgery, told CBC News. Rutgers and Stanford researchers recently published a mathematical model in JAMA Facial Plastic Surgery to explain how selfies provide distorted facial images and can skew a subject's self-image. 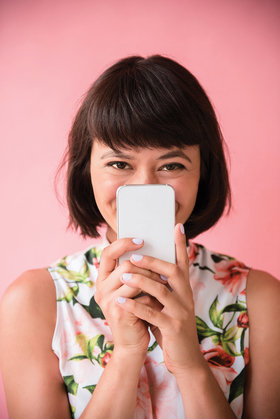 According to the study, an average selfie taken about 12 inches from the face makes the nasal base appear approximately 30% wider than the one taken from a standard portrait distance, which gives a more proportional representation of their facial features. "Young adults are constantly taking selfies to post to social media and think those images are representative of how they really look, which can have an impact on their emotional state," Paskhover told Science Daily. "I want them to realize that when they take a selfie, they are in essence looking into a portable funhouse mirror."